I have quite a few questions. How much Happiness does one power item(i.e. Protein) give a Pokemon? 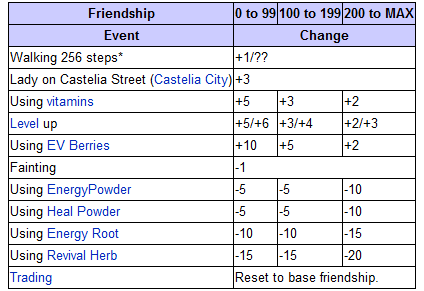 How much happiness does an EV reducing Berry(i.e. Pomeg) give a Pokemon? What is the max happiness level of a Pokemon? How much happiness does increasing a Pokemons level give? How much happiness does a Pokemon need to have to learn Draco Meteor? Can you release a Pokemon at max happiness? How much happiness do certain Pokemon need to evolve(i.e. Riolu, Budew,ect.)? What is the earliest level Pokemon who evolve via happiness can evolve? How much does letting your Pokemon be KOed lower the happiness? How much do the herbs lower happiness? -Bulbapedia says that they may refuse to be released however I just checked on my volcarona(who has 255 happinesss) and it never came back. I also tried my mewtwo who had full happiness and it came back because it "missed me" and also my mewtwo was not the only Pokemon in my party and knew no HM's. So I guess it just depends on the Pokemon because it did for one of my Pokemon but not the other. You cant release a full happiness pokemon??? huh. Your answer is better than mine, upvote. There is a possiblity that it will because it "misses you"